Whether you're building a house, constructing an outdoor kitchen, or remodeling your bathroom, one of the main concern that you'll have for the project is installing new plumbing. If the plumbing of these projects doesn't work properly, your new construction will be a source of frustration, so it's important that you hire a professional plumber you know you can trust for this job. Water and gas lines, plumbing fixtures, and pipes all need to be installed perfectly. Ar Cooper's Inc., our plumbers will be able to provide you with high quality new construction plumbing installations for both residential and commercial projects. We'll work with you and your construction contractors throughout the process to ensure that every part of our job is completed in compliance with every other part of your project. Call us today to schedule your plumbing services, and we'll be looking forward to assisting you. When you're building a new home, any problems with the plumbing system installation can lead to disastrous, frustrating, and expensive complications. It's very important that you have a plumber involved from the beginning of the design. Our experienced plumbers will be able to help you ensure that your new home's plumbing system is in great shape. We'll work with you to select water heaters and other plumbing fixtures that are perfect your home, and we'll handle every aspect of the job, from septic service and outdoor plumbing to shower systems and kitchen plumbing. 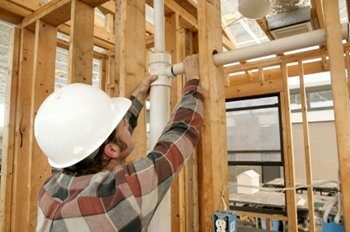 Why Choose Us for New Construction Plumbing Installation in Topeka? Our plumbers have been working with homeowners in the Topeka area since 1986, and we have the expertise and experience to guarantee that this job will be completed up to the highest standards of quality. We'll work with you directly throughout the process, and we'll do whatever it takes to ensure that you're totally satisfied with our work. We know how important your plumbing system is to your home, so we always strive to provide the highest quality service possible. For residential or commercial new construction plumbing installation in Topeka, please call Cooper's Inc at 785-267-4100 or complete our online request form.